The district of Wayanad is endowed with natural beauty and rich cultural heritage. Christu Jyothi provincial house stands in the central part of Bathery and it is in the diocese of Mananthavady. When the Mary Matha province was divided into 2 provinces; Christu Jyothi province chose Bathery as its hearquarters. Christu Jyothi Province was formed in the year of Great Jubilee 2000 and the province received the light of Christ and named as Christu Jyothi . On 6th February, 2000 the province started its activities at the Vimala Mary Convent, Pulpally. Later Christu Jyothi Provincial House was shifted to Bathery on 21st January, 2001. They celebrate Province’s day on 20th May. 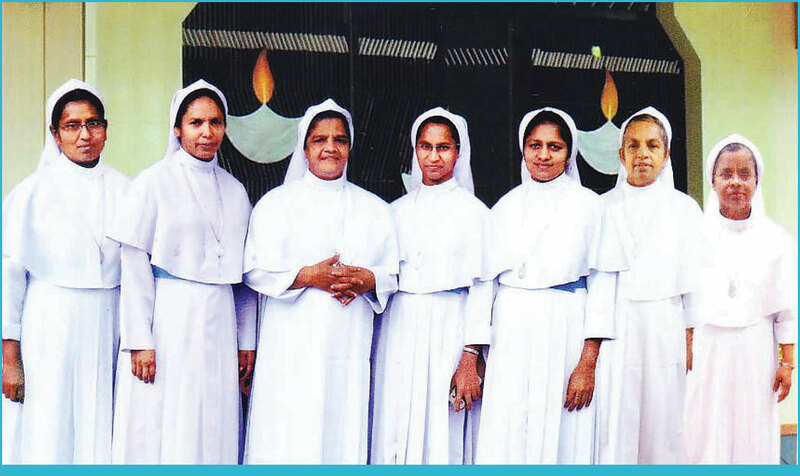 Sr. Innocent, Sr.Camilla and Sr. Lilly Jose, Sr. Benigna, Sr. Seena were the former provincials who guided the province. At present province is animated by Sr. Jossy Augustine with her council. The meticulously ordered administrative system enables the province to meet all the challenges and possibilities of administration. For providing proper faith formation to children and youth they are actively involved in the various activities of the Church.Christu Jyothi radiates its light in 3 dioceses in India and 3 dioceses abroad. Infront of the provincial house there is a centre, Marian Villa, where they give prominence to the Social service activities. It is a place of consolation and relief for the flock, mainly to those who are affected by sickle cell anemia. There also functions an Ayurvedic dispensary. Carmelaram P.O, Chikkabelandur, Bangalore -35. St. Jude’s Church, Udayanagar, K.Narayanapura, Bangalore – 16, Karnataka. Maria Nagar, Cantonment, Bellary - 583 104, Karnataka. Gudalloor Bazar P.O, Nilgiris Dt, 643 212, Tamil Nadu. Gordeler Str. 21, 49565 Bramsche, Germany. Wilmendyk 78a, 47803 Krefeld, Germany. Haus St.Franziskus, Kondrad Martar-WEG-3, 51688 Wipperfurth, Germany. Heggadde P.O. Sakalespur, TQ, Hassan (Dt. ), Karnataka, 573 145. Jambunatha road, Bellary (Dit), Hospet-583 201, Karnataka. 13. Piazza Golsi -11, 20081 Abbiategrasso, Milano, Italy. Oratorio San.Luigi Conzaga, Via Manzioni- 23, 20031 Binzago di Cesano Maderno, Milano, Italy. Kandali P.O, Hassan Dt. 573 217, Karnataka. Kayyoor P.O, Kottayam Dt.686 651. Kunnaldy, Uppatty P.O, Nilgiris Dt. 643 241, Tamil Nadu. Makkiad P.O, Vellamunda(via), Wayanad Dt 670 731. Engineering College Road, Mandya - 571 401 Karnataka. Marakave, Pulpally, Veliyambam P.O, Wayanad (Dit),673579. Nilambur P.O, Malappuram ( Dit.) 679 329. Gudalloor Bazar P.O, P.B. No. 13, Dharmagiri, Ovaly , 643 212. Dasandoddy.P.O. , Mandya.Dt. 571 430, Karnataka. Puthurvayal, Marthoma Nagar P.O, Gudalloor, Nilgiris Dt. Thalapuzha P.O, Mananthavady, Wayanad Dt, 670 644. Valavoor P.O, Pala Via, Kottayam (Dit), 686 635.